The core of the grid. A blinding sphere of light, teeming with energy, crackling with flame. Beyond were only twinkling bits of data in a field of darkness. No hacker dared approach the core, except one. 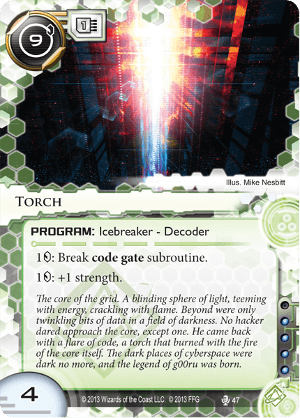 He came back with a flare of code, a torch that burned with the fire of the core itself. The dark places of cyberspace were dark no more, and the legend of g00ru was born. Decoders. If you want some good decoder, you go to the Shapers, so no suprise that these precious little thing is burning green. Ok, at 9 you can say anything about the Torch, but not "little thing". But if you are not running with stealth credits and Refractor or Yog.0 and Datasucker this is the most efficient universal decoder you can get. Cyber-Cypher has the same strenght, but can be used only on one server. At this moment, the dawn of Order and Chaos, 10 out of 33 codegates have strenght higher than 4. Torch burns thru such fan favourites like Chum, Lotus Field (something that Yog.0 can break only when installed on Dinosaurus ) or Viper for one or two creds. Tollbooth is five . So if you are not planning on bringing D4v1d with you, this is good starting point for stronger codegates that are coming with Order and Chaos: Checkpoint, Wormhole and Orion. Criminal Leviathan can be more expensive at the middle-range ICE. But 9 is serious money. At the cost of 4 influence, you don't really have much options but to play it only in the Shaper deck, which heave the most tools to help you out bring it fast and cheap. You could always use Self-modifying Code, but do you really want to pay 11 ? More useful is Test Run + Scavenge combo, which lets you install it for 3 credits. If you are playing Prepaid VoicePAD, it can be even cheaper. Kate "Mac" McCaffrey: Digital Tinker can install it for 5 with Modded. And if you manage to put it in your heap, you can use Anarch Retrieval Run. There could be also some cases when using Code Siphon has some point. But Test Run Scavenge is most reliable in-faction. It's fat, it's expensive, but I love my little Torch. You need to build economy around this card, but when it works, it's fun and efficient. I know this is almost rotated out, but doing the math it's not really a bad card compared to the pretty efficient Inversificator. For gear check ice (0-2 strength) there's no efficiency difference since Inversificator has base strength 2. For 3 strength ice Torch is 1 cheaper (0 vs 1 for Inversificator). For 4 strength it's 2 (Torch doesn't need a boost, Inversificator needs 2 boost) and from there it's constant (both need boosting and are equally efficient at it). 4 and 5 strength code gates are common enough to matter (Mausolus, Fairchild 3.0, Lotus Field, Authenticator (ok, I just expect Authenticator to be popular)). And that 2 difference per run can quickly bridge the difference in install cost. But it doesn't matter really. Because you only need to break a hard code gate once with Inversificator to swap it with something less annoying. That makes Inversificator much more effective than it shows from the raw numbers. And there's also the major difference in install timing. A 6 breaker can be installed earlier than a 9 breaker and doesn't empty your bank account if you did a "start of game - Hedge Fund" opening. I do think that Torch and Inversificator are related. They're both expensive breakers with 1/1 break/boost cost. The fact that Inversificator has been released close to Torch rotating out makes me think it's a replacement. It would make sense in that case that it is more efficient because Torch is rarely seen in the wild. And unlike with Paperclip FFG managed to not make it so efficient that it's always better than the previous king (Gordian Blade).